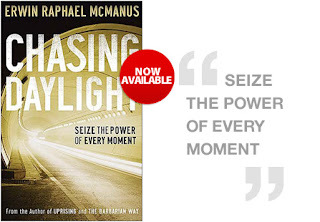 Well a few weeks ago Steven Knox (the college pastor at HFBC) recommended that I read Chasing Daylight by Erwin McManus. NEVER IN MY LIFE HAS A BOOK CHANGED MY LIFE (other than the Bible of course). I typically knock out a book every few weeks. It has been 3 weeks and I’m just starting chapter 4. Every page brings conviction, freedom, and inspiration. I’ve decided that I am going to live life. Really live it. What is funny is before I became a Christian that was one of my biggest reasons for not wanting to be a Christian. I saw the way most Christians lived and I didn’t want that boring, goody-two-shoes life. I wanted adventure, risk, and passion. I thought the only way to have that was to experience the world. What a limited perspective I had. To live life, I don’t need to experience more of the world; I need to experience more of Christ. I need to stop living my life to be like other Christians and start living my life to be more like Jesus. This morning as I was praying that I would “chase daylight” today I felt convicted. Convicted that most of life up to this point I wasn’t really “chasing daylight” (even though I thought I was), I was really just chasing rabbits. My hope, my prayer and encouragement for you today is that you would live life— “chasing daylight.” Our time on earth is brief. What will you/we do with it? What rabbits do you need to stop chasing? You can read more about the book and/or purchase it here.